Although uncommon, tooth extractions may be necessary in the event of severe dental decay, injury, or extreme crowding. Our experienced Mountain View dentist, Dr. Donian Shen, will make every effort to save the tooth via root canal or another method. In the event it must be removed, however, she will utilize the latest techniques to make your time with us as pleasant and comfortable as possible. If you experience dental anxiety or are nervous about your procedure, we offer sedation dentistry options (oral and IV) to help you feel calm and relaxed during treatment. 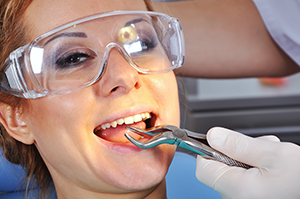 Once the tooth is removed, it’s important to replace it to ensure a healthy smile and functional bite. We offer a comprehensive selection of restorative options, including dental implants and dental bridges. We will discuss your needs and goals during your initial consultation to determine which approach can provide optimal results. Following the extraction, we will ask you to bite down on a gauze pad for about 30 to 45 minutes to help speed the healing process. You may want to take it easy for about a day, as remaining relaxed can lower blood pressure and reduce bleeding. Ice packs and over-the-counter pain medication can help minimize swelling and any discomfort. To aid the healing process, we encourage you to drink lots of fluids and eat soft foods while your gums recover. You should also avoid alcoholic beverages and spicy food during this period. In a few days, or whenever you feel comfortable, you may begin eating normally again. After meals, carefully rinse the extraction site so no food particles remain. About 24 hours after the extraction, you can brush and floss as usual to help your mouth stay clean and fresh. Though complications are rare, if you experience heavy bleeding, severe pain, or continued swelling after several days, or if you have an adverse reaction to medicine, call us immediately. *This fee can be applied to a treatment if the patient goes through the treatment. However, if no treatment is performed, then the fee is non-refundable.